The rule of thumb in financial planning circles is that you shouldn’t spend more than 25% of your income on housing costs. But if you live in certain cities, it might be a tad difficult to follow that rule. Pity New Yorkers, whose rent costs 63.1% of their income. And New York is cheap compared with other locations. The accompanying chart compiles data from The Global Cities Business Alliance, which compared the average wage of workers in different cities around the world with the average rental cost, creating a percentage that is not favorable in places like Boston (29.8% on average), Sao Paulo, Brazil (30.2%) or Sydney, Australia (32.1%). 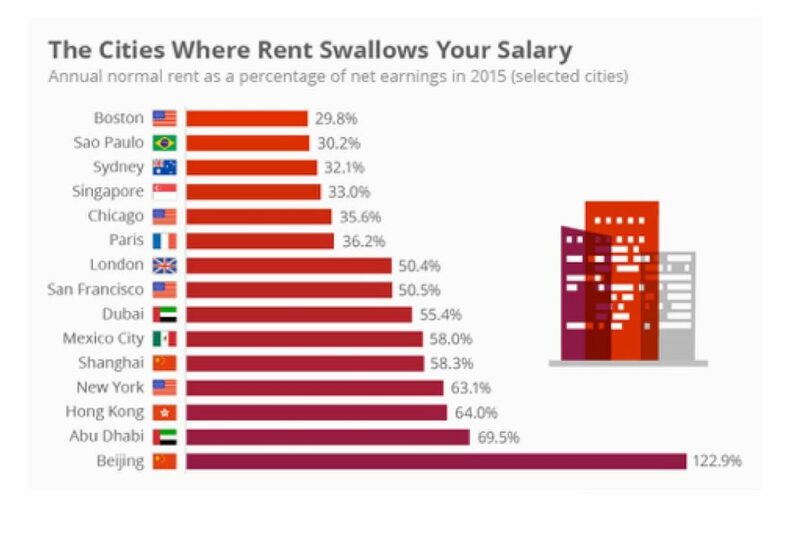 But those cities are downright cheap compared with New York, Hong Kong (64.0%) Abu Dhabi (69.5%) or the outlier: Chinese capital Beijing, where rental housing costs 122.9% of the average worker’s income. If you lived in Beijing, you would have to pay every dollar you earned, plus borrow money each month, equivalent to a fifth of your total income, just to afford normal housing. From a financial planning perspective, we wouldn’t recommend it. Please Note: This article is used with permission from a newsletter to which KFG subscribes. It is for our clients only and may not be republished.